VILLAS AND APARTMENTS TO RENT IN THE CYCLADES, GREECE. Welcome to our selection of holiday homes to rent in the Cyclades, Greece. Any place in Greece lives up to its name as a great holiday destination and Cyclades is no exception. A visit to this beautiful town is a mix of history, natural beauty and fun activities. Visit the Venetian Museum, which is housed in a typical Kastro house and which, besides a small collection, host�s traditional music and dance events. If the sea and beach is what you enjoy most, the Panormos beach with its clear and calm waters is just the place to relax or indulge in some water sport. If you are a hard-core swimming enthusiast, make it a point to go to Milos, which is considered the absolute swimming destination. Or, if you just want to take it easy and relax, pick a vantage point and enjoy the spectacular views of the island. If this doesn�t give you a heady feeling, indulge the connoisseur in you with a visit to Santo Winery for some wine tasting. Move on to the Old Town to enjoy its charming atmosphere with its maze of passageways, shops, restaurants and beautiful homes. You can spend hours here! If you don�t mind walking, the Ancient Thera is a great place to see the 11th century BC Dorian settlements, which include remains from the Hellenistic, Roman and Byzantine periods. A trip to the harbour will have you admiring the Portara, which are the gates of a 7th Century BC temple that was never completed. It is among the most photographed places in Greece and you too are sure to click some great shots. The sunsets here are awesome and the scenery adds to the picture postcard beauty of the place. From here, you can head to the Church of Paraportianito to admire its beautiful setting. At the Avenue of the Lions you will be walking an ancient street dating back to the 7th Century BC, while admiring the several majestic lions carved out of stone. Not far is Kastro, where you can take in a 16th century Cathedral, the Archaeological and the Venetian Museum. Ever seen a volcano site? A trip to the Santorini Volcano is just what you need. What�s more, there are some hot springs here to soothe those muscles tired by all the walking! The mountaintop makes for some lovely scenery. From here, move on to Little Venice to catch the spectacular sunsets. This is something that you are not likely to forget in your lifetime! Close by are many Churches and monasteries here that date back many centuries. Besides, the many beaches with the water sports and spectacular picture post card views make Cyclades a great place to visit! 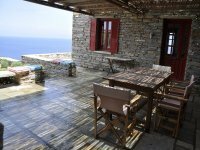 Looking for self catering holiday accommodation in the Cyclades? 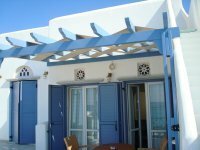 Then below is a selection of apartments in the Cyclades and villas in the Cyclades that can be rented direct from their owners. You can either click on each listing for further details or you can use our search engine on the left if you are looking for something in particular. The Cyclades is a group of islands located in the Aegean Sea. Transport between the islands is easily obtained, travelling to each of them within a single holiday is a very common and all of the islands are diverse and unique from one another. Located on the island of Santorini, Akrotiri was a town that was destroyed and preserved by a volcanic eruption 3600 years ago, and is thought to contain over 40 buildings. Not only is it older than the disaster of Pompeii, but very different. Tools, objects and pots remain where their owners had left them and there are no human remains, meaning the city was likely evacuated before the eruption. Called the new and old burnt islands, Nea Kameni and its nearby neighbouring island Palea Kameni is visited every single day by tourists. Although the islands are barren and have no inhabitants, it has a lot of visitors, who like to visit it to climb the 130 metre high volcanic crater. On Naxos Island, the Temple of Demeter was pretty much destroyed. During a dig however pillars and columns where found buried at the site, and so over time it has been restored to its present state by the German Archaeologists that discovered the lost pieces. Although it�s quite far out, getting there is easy enough as roads lead close by to a local church. There are several airports available, with two international airports being available on Mykonos and Santorini with charter flights coming in from Europe. The Cyclades is a group of islands located in the Aegean Sea, in the Mediterranean Sea. Due to its location its climate is hot and sunny, especially during the summer when there is very little rainfall.